Coinbase Review | SCAM or LEGIT Crypto Exchange? Coinbase is one of the most popular cryptocurrency exchanges in the industry. One of the main reasons for this is that they make it super easy for first-time users to buy cryptocurrencies with a debit or credit card, as well as a bank transfer. The platform currently supports 10 different cryptocurrencies, including major coins such as Bitcoin, Ethereum, Bitcoin Cash and Litecoin. 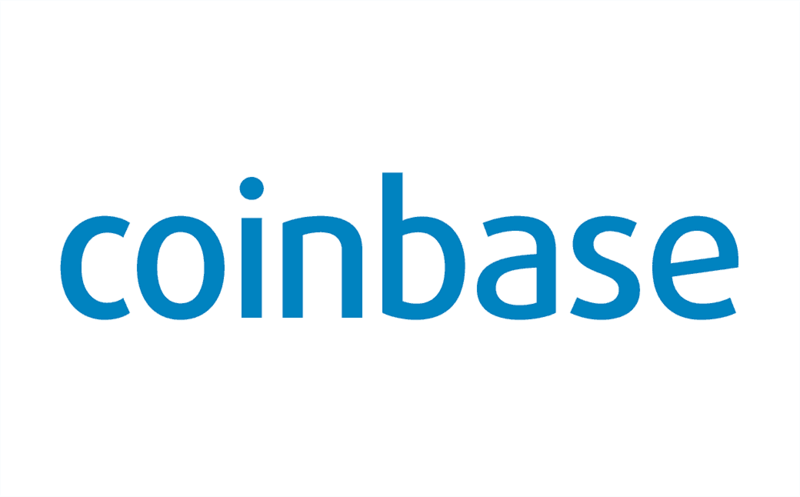 If you’re looking to find out more about Coinbase, then be sure to read our comprehensive guide. We’ll cover who the exchange is, what cryptocurrencies they support, what their fees are like, how good their security is, and more. As a snap-shot overview, while Coinbase is certainly a notable exchange to consider, it might be worth opting for a regulated platform like eToro. You’ll have access to more cryptocurrencies, they’re heavily regulated, they accept multiple payment methods, and best of all – you also have the option of going short. ❌We do not recommend Coinbase due to its extremely high fees, lack of safety, and the number of accounts, deposits and withdrawals that they block on a daily basis. eToro is a much more affordable service and is highly regulated by several financial authorities, providing a safer and much more cost-effective trading experience and allowing users to trade crypto CFDs with leverage, making it possible to generate much greater returns. Click here to compare different cryptocurrency exchanges, or visit our guide on how to buy Bitcoin and other cryptocurrencies. 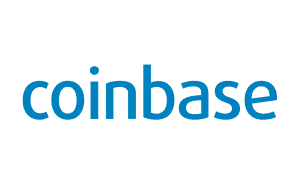 Coinbase is a cryptocurrency exchange that allows you to buy and sell a range of digital currencies. This includes popular cryptocurrencies such as Bitcoin and Ethereum, as well as ERC-20 tokens like USDC. Launched in 2012, the U.S. based exchange claims to have more than 13 million users. One of the main appeals to using Coinbase is that they allow you to buy and sell cryptocurrencies using everyday payment methods. This includes a debit and credit card, bank transfer and in some cases – PayPal (Coinbase is one of the most well-known Paypal cryptocurrency platforms). In response to Coinbase increasing their customer base, the platform recently released a sister cryptocurrency exchange called Coinbase Pro (previously GDAX). Coinbase is somewhat different from other well-known cryptocurrency exchanges as they are more of a broker than an exchange. This means that when you buy cryptocurrencies on the platform, you are actually purchasing the coins directly from Coinbase, as opposed to trading them with other users. 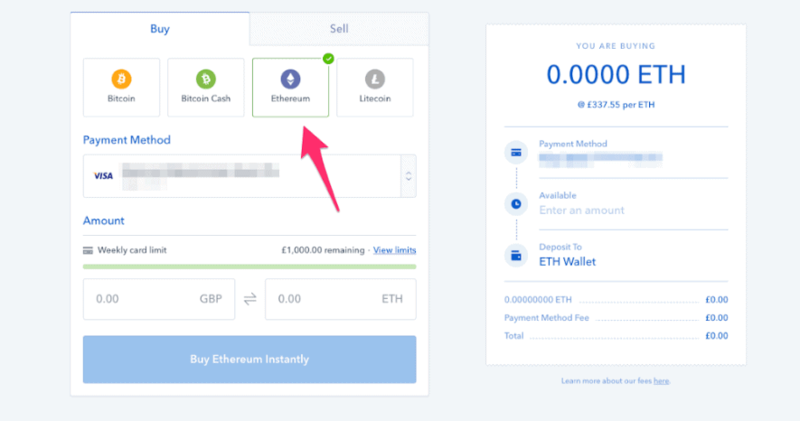 In return for this, Coinbase charges you to deposit and withdraw funds, as well as a transaction/trading fee every time you buy or sell coins. Once you’ve bought cryptocurrencies from the platform, you then have the choice of withdrawing them out to a private wallet or storing them within your Coinbase account. Don’t forget, unlike eToro, you only have the option of going long at Coinbase. This means that you can’t make a profit if you think the markets are going to go down. What cryptocurrencies does Coinbase support? At the time of writing in April 2019, Coinbase supports 10 different cryptocurrencies. In order to see what you can buy within your account, simply head over to the Buy/Sell section and view the drop-down list. Which countries does Coinbase support? When it comes to fees at Coinbase, this will depend on the specific account activity you are looking to perform. You’ll pay fees every time you deposit or withdraw funds, and every time you buy or sell a cryptocurrency. Let’s break the fees down in more detail. All Coinbase trading fees amount to 1.49% of the total transaction amount. For example, if you want to purchase $1,000 worth of Bitcoin using your debit card, you will pay $14.49 (on top of the deposit fee charge). Moving forward, if you then decided to sell your Bitcoin back to USD, then you would have to pay the 1.49% transaction fee again. This is really expensive, and actually makes Coinbase one of the most expensive cryptocurrency exchanges for buying and selling coins. Moreover, these trading fees make frequent trading completely unviable. While at least cheaper than VirWoX, this is even more expensive than Coinjar and Coinfloor, which at 1% and 0.3%, respectively, are well-known for being costly exchanges. On the contrary, cryptocurrency platforms such as eToro charge just a fraction of this, and trading fees are instead built into really tight spreads. This is hugely important, as otherwise, you are going to have your trading profits eaten away by transaction fees. One of the best features of Coinbase is that the platform is super easy to use. Although the exchange is perfectly suitable for those that have lots of trading experience, it’s also great for beginners. When you first log in to the site, you’ll instantly be presented with the main dashboard. At the top of the screen, you’ll have the option to buy or sell, view your account, access additional trading tools, and amend your settings. As you’ll see from the above screenshot, the platform is really crisp, which makes it easy to navigate through all of the different dashboard options. You also have the option to view your portfolio of cryptocurrencies in a really simple way. This includes the current price in your local currency, and what percentage the coin has increased or decreased over the past 24 hours. 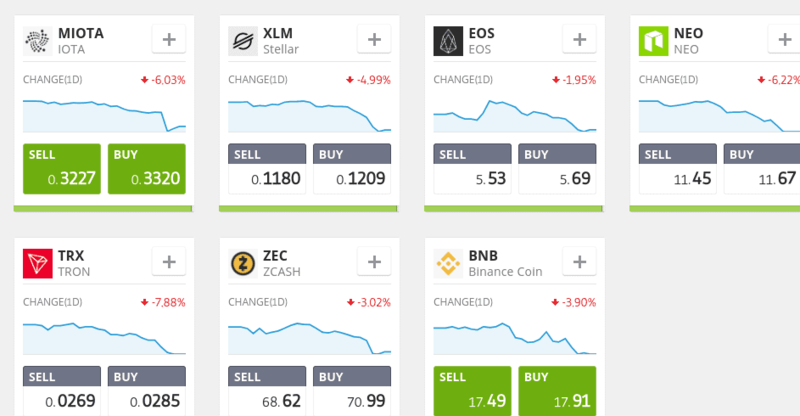 When you go into the settings page, you can amend the portfolio view so that it shows your chosen cryptocurrencies, and you can extend the 24-hour increase/decrease stats to a longer period. The Coinbase dashboard is also really useful for viewing your account history. This includes reports on your historical transactions. You can also view a full list of trades that you made, alongside the respective fees that you paid. 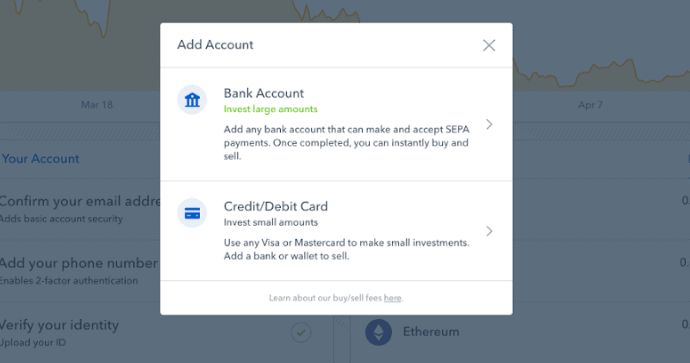 Although we would suggest using eToro to buy and sell cryptocurrencies, if you want to go ahead and open an account with Coinbase, then we’ve listed a detailed step-by-step guide below. First, you will need to head over to the official Coinbase website, and click on ‘open account’. Here you will need to enter a range of personal information, such as your full legal name and your country of residence. Once you’ve entered your personal information, you’ll then need to verify your email address. Simple click on the link that Coinbase sends to your email address, and this will be confirmed. You’ll also need to confirm your phone number. To do this, Coinbase will send a unique PIN number to your phone. Once it arrives you then need to enter it into your Coinbase account. 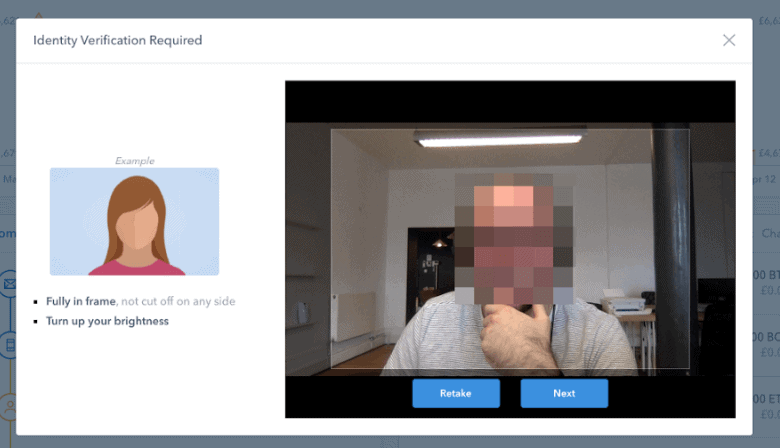 It is important that you provide your correct phone number because you will need this to log in to your account if you set up two-factor authentication. This is an additional security step that we will discuss further down. As you’ll see from the above screenshot, the next step is to verify your identity. In order to remain compliant with regulators, Coinbase is required to verify your identity before you start trading. This will require you to upload a copy of your government issued ID. This will either need to be a copy of your passport or a copy of your driving license. Depending on the country you live in, you might be permitted to upload a government-issued ID card. 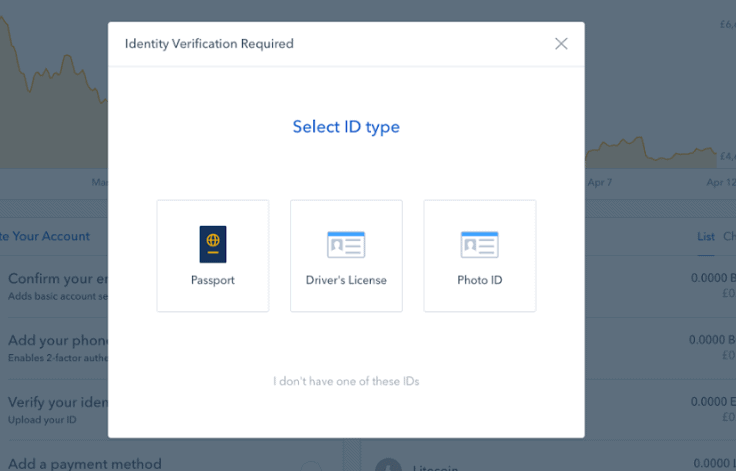 As Coinbase use FinTech that is able to verify your ID automatically, you should have your identity confirmed within a couple of minutes. If the copy that you upload is not clear enough, then you’ll need to re-submit it. You will also need to take a selfie to confirm that you are the true owner of the ID you uploaded. You can do this through your desktop or mobile device. Check out the screenshot below. 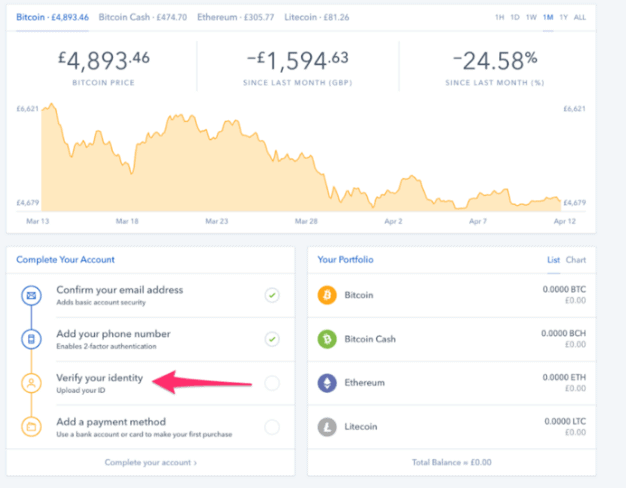 At this stage of our step-by-step guide, you should now have your Coinbase account fully verified. The next step will require you to deposit funds. Your deposit options will be based on your country of residence, however, in most cases, this will either a debit/credit card or bank transfer. Click on ‘add payment method’, and then decide what deposit method you want to link. The quickest way to deposit funds is via a debit or credit card, as this is instant. If you want to deposit larger amounts, you might want to consider using a bank transfer. However, it can take up to a week before the funds arrive in your account, so do bear this in mind. So now that you’ve opened your account, verified your identity and deposited funds, you’re now ready to buy some cryptocurrencies. You have the option of buying 10 different coins. Don’t forget, you’re going to pay a transaction fee of 1.49% every time you buy or sell coins with Coinbase. This is why we would suggest checking out eToro. Trading fees are significantly lower, they list 15 coins, and you can even go short on your trades. Nevertheless, at the top of the screen click on ‘buy/sell’. You’ll then see a list that displays the cryptocurrencies you can buy. In our example, we are going to buy Ethereum. For security purposes, we’ve blurred out our payment information! You then need to enter the amount of cryptocurrency that you want to buy, in your local currency. You’ll see the equivalent amount in cryptocurrency update in the box, and you’ll also see the fees on the right-hand side. Finally, to complete your trade, simply click on the blue box that displays ‘Buy Ethereum Instantly‘. Obviously, if you are buying a different cryptocurrency, this will display the name of the coin you are buying! Coinbase, Inc., the company which operates Coinbase and Coinbase Pro in the U.S., is licensed to engage in money transmission in most U.S. jurisdictions. Most of Coinbase’s money transmission licenses cover US Dollar Wallets and transfers. One of the most important aspects when deciding whether or not use a cryptocurrency exchange is safety. After all, you don’t want to deposit your own money if its at risk. This couldn’t be truer in the cryptocurrency industry, as hacks seem to a common occurrence. While Coinbase is one of the few exchanges that are regulated, it has been involved in several hack scandals. In January 2018 , a string of hacks that targeted Coinbase led to a loss of more than 40 BTC of different users. Some users lost around $10,000 Bitcoins and were hacked several times. Not all users were refunded by Coinbase, and while the exchange implemented a number of security measures to prevent hacks, Coinbase remains largely unsafe, and for this reason we cannot endorse this platform. Nevertheless, here’s a break down of security features available at Coinbase. Does Coinbase have a wallet? Coinbase now offers a mobile wallet that allows you to store a range of cryptocurrencies. including all ERC-20 tokens. This allows you to send and receive crypto at the click of a button. The wallet is available to download on both iTunes and Android stores. If you don’t want to use your mobile phone to store your coins, you’ll need to keep them in your Coinbase account. Don’t forget, if your account is hacked, you could lose your entire balance. Does Coinbase have an app? Coinbase has a mobile app that is available on both iOS and Android devices. The app allows you to perform all of the same account functions as you can online. This includes the ability to buy and sell crypto, deposit and withdraw funds, and view your account history. When we tested the app out ourselves, we were really impressed with the overall layout. There were no issues navigating from section-to-section, which makes it perfect for trading on the go. Don’t forget, if trading on the move is one of your main priorities, then eToro also have a dedicated app. On top of paying significantly less in fees, you also have the protection of leading European regulators. Coinbase has a huge team of customer support agents at your disposal. Here’s a list of the various ways you can contact the team. 📱 Phone support: Available 24 hours a day, 7 days a week, 365 days a year. U.S. and UK toll numbers only. 📧 Email support: Contact the Coinbase team via email at any time. #️⃣ Twitter: You can also reach the Coinbase team through Twitter, however never post any sensitive account info. In order to allow you to make an informed decision on whether Coinbase is the right cryptocurrency exchange for you, we’ve decided to compare it with eToro. Although eToro is well-known for their extensive CFD offerings in the forex, stocks and shares, indices and commodity sectors, they are offered specialize in the buying and selling of cryptocurrencies. 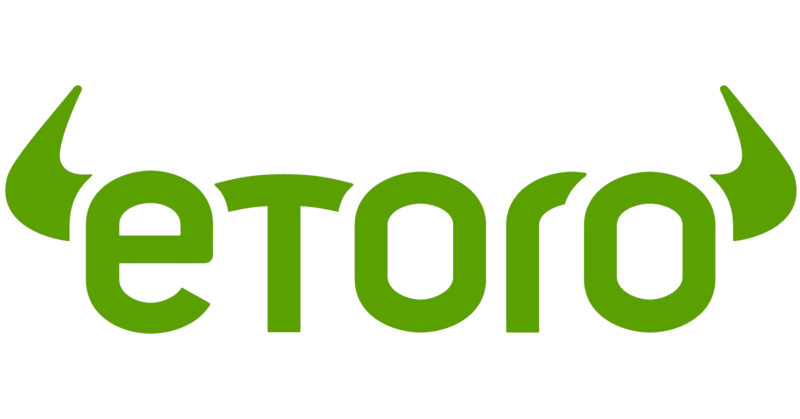 Not only this, but eToro also offers an online wallet that allows you to safely store your cryptocurrency investments. ✅eToro allows you to choose from 15 different cryptocurrencies, as opposed to the 10 that Coinbase list. ✅While Coinbase is not regulated by any European financial bodies, eToro is licensed by both the FCA (UK) and CySEC (Cyprus). This gives you regulatory protection on two main fronts. ✅Fees at Coinbase are considerably higher. Not only do you need to pay 4.99% to use your debit/credit card, but you also need to pay 1.49% every time you trade. eToro fees are tiny in comparison, which is included in their small spreads. ✅eToro also gives you the freedom of trading other assets such as stocks and shares, or commodities. With Coinbase, you’ll purely be limited to just cryptocurrencies. As cryptocurrency exchanges go, Coinbase is certainly up there with the best of them. The platform makes it super easy to buy coins, which is perfect if you’re a newbie trader. They’re also great if you’re looking to use a debit or credit card to deposit funds, as this can be done instantly. However, if you’re looking to take things to the next level, you might need more features at your disposal, and the extremely high Coinbase fees will eat into your margin making it difficult to profit from the markets. By using a platform like Toro, you’ll have the choice of trading more coins, and different asset classes as well as having more useful features such as copy trading, and having the backing of top European regulators. However, and perhaps more importantly, eToro allows you to both go long and short, which means you can make gains if you think a coin is going to go down in value. This is something that you cannot do at Coinbase, and there is no indication that this will ever be possible. eToro is a multi-asset platform that offers CFD and non-CFD products. 76% of retail investor accounts lose money when trading CFDs with this provider. Your investment is at risk and you could lose your money investment. How many coins do Coinbase list? Coinbase only lists a total of 10 coins. If you want more flexibility, it might be worth using eToro as they offer a higher number of cryptocurrencies. Can you 'short' cryptocurrencies on Coinbase? Unfortunately not. Coinbase only gives you the option of buying coins and then selling them at a later date. This means that you are not able to make a profit if you believe that the markets will go down. If you do want the option of going both long and short, then your best bet is to use eToro. How do I contact Coinbase via live chat? Coinbase does not offer a live chat facility. If you need to get hold of the team, you’ll need to send them an email, or give them a call (24/7). At present, you have the option of a U.S. or UK toll number. How much are the Coinbase trading fees? Coinbase charges users 1.49% every time you buy or sell cryptocurrencies. This is hugely expensive, and not viable for those that want to trade regularly. Is Coinbase easy to use? Coinbase is extremely simple to use – both online and via the mobile app. This makes it perfect for beginners. Do I need to verify my identity to use Coinbase? You do. You’ll need to upload a copy of your government issued ID, such as a passport or driving license. Can I withdraw funds back to my debit or credit card? Although Coinbase allows you to deposit funds using a debit or credit card, you won’t be able to withdraw money back. Instead, you’ll need to withdraw to a bank account. Depending on your country of residence, you might also be able to make a withdrawal back to your PayPal account. Coinbase does not offer leverage on any of the cryptocurrencies it lists. If leverage if something that you want to implement into your trading strategy, then you’ll need to use Etoro. 3 How does Coinbase Work? 4 What cryptocurrencies does Coinbase support? 5 Which countries does Coinbase support? 11 Does Coinbase have a wallet? 12 Does Coinbase have an app?